I have no words to describe what this guy is actually doing on his flute. Robbie Maddison jumps up to - and back down from - the Arc de Triomphe. Awesome. This kid tears it up on a guitar that's bigger than he is! SAVOGNIN, Switzerland – Swiss rescue officials say they have found two missing skiers after spotting the light from their MP3 music player. The Swiss air rescue association Rega says it received a distress call from the French tourists late Friday but the skiers' phone battery went dead before they could be reached. Rega spokesman Gery Baumann says the two men were eventually found after midnight in steep, wooded terrain by a helicopter crew that spotted the light from their digital music player. Baumann said Saturday that the two 22-year-olds suffered only mild hypothermia despite enduring temperatures as low as 5 degrees Fahrenheit (minus 15 degrees Celsius). The incident happened near the town of Savognin in southeastern Switzerland. Seeing is believing. 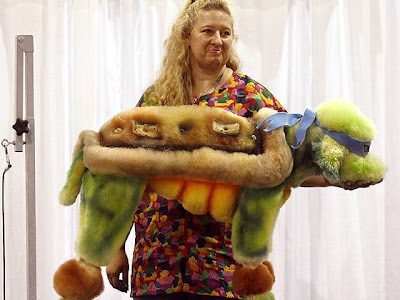 Sandy Paws Creative Per Grooming has come up with a Leonardoodle. Poodle-Power!!!!!!!!!!!!!!! !